The 31st annual International Perfume Bottle Association convention will be held in Itasca, Illinois (Chicago suburb) on May 2-5, 2019. What a wonderful event it will be! Seminars, presentations, guest speakers, collectors marketplace, auction and a fabulous exhibitor hall will be on the agenda for this annual event. In addition, a once in a lifetime Gala event, celebrating the grand opening of the Perfume Passage museum will be the highlight of the weekend! The convention is the most exciting weekend in perfume bottle and compact collecting! It is a four-day extravaganza featuring the world's premiere exhibition and sale with the field's leading dealers featuring thousands of bottles, compacts and ladies vanity items. The convention draws together collectors and dealers from around the world. A panel discussion on "Centuries of Antique Perfume Bottles" starting with the Boudoir of the Ancients to the late 19th century scent bottles will be a journey through time. An Art Deco Symposium with three segments focusing on ephemera, Czech Art Deco and mesh purses/compacts will be on the agenda. Be prepared to fall in love with all things Deco! Specialty groups within the IPBA allow members to share their knowledge and their passion within their specialty collecting field. It's a unique opportunity for like-minded specialty collectors, at last, to come together and focus on what they love. It's a venue for networking, developing new friendships and enhancing your collecting experience. This year, our specialty groups will gather for "Vanity Table Talks," sharing information on topics such as compacts, purses, novelties, perfume burners and Czech bottles. Attendees will have the opportunity to visit two sessions to learn more about their favorite items as well as other wonderful collectible items! The "Compact and Vanities Specialty Group" continues to send out a quarterly E-news to our members. The annual auction is always a night to remember! It will feature over 250 lots of vintage perfume bottles, compacts and vanity items. Director Ken Leach compiles a fantastic catalog of perfume bottles and vanity items priced for every level of collector, while celebrity auctioneer Nicholas Dawes will inspire the crowd with his usual entertaining delivery! The IPBA began in 1988 with 18 members. Today the Association has almost 900 members from 19 countries. The IPBA provides information about all aspects of perfume bottles and related vanity items including their uses, history and manufacture. They promote collecting of perfume bottles, compacts, powder boxes, purses and vanity items. Membership includes a quarterly full-color magazine -- The Perfume Bottle Quarterly, regular informative email updates, a lending library of over 250 books on bottles and related subjects, a youth membership -- IPBA Young Collectors -- for youngsters aged 7 to 18 years old. The Association's website includes a virtual museum with 24 categories of perfume related collectibles to scroll through and drool over! The annual convention for collectors around the world is held each year in a different city. The exhibitor hall includes over 20,000 vintage perfume bottles, compacts, powder boxes, purses and related items for sale and on exhibit -- the largest selection ever brought together in one place. Click here to view the IPBA website for more information on the convention and the Association! The following books on compacts are a great reference for collectors and all have great photographs! Laura Jean Allen: She was a noted illustrator and author of children’s books. Some of her illustrations featuring teenager scenes were used on a series of compacts by Rex Fifth Avenue in the 1950s. Bliss Brothers: BBCo., Attleboro, MA. The mark was usually a small "B" and "Co." within a larger "B." Bourjois, Inc.: A. Bourjois & Co., Inc., NY. They made the Evening in Paris vanity items. Briggs: Maker of nice quality compacts in the 1920-30s, Attleboro, MA. Marked DFBCo. Clarice Jane: A compact trademark of Elgin American and the Illinois Watch Co.
Coty: A perfume and cosmetic company from New York. Divine: A trademark found in tiny glove compacts with decorative lids, often done in silhouette. Djer-Kiss Kerkoff: A trademark of Kerkoff, a Parisian cosmetics firm. Their most famous design is the silver “kissing fairies” compact. Dorothy Gray: A NY cosmetic firm that flourished in the 1950s-60s. Elgin American Manufacturing: EAM Co., Elgin IL. Elginite was a trademark for their white metal cases. They made great deco compacts. Evans: The Evans Case Company from Attleboro, MA was one of the most prolific producers of high quality compacts and carryalls, as well as cigarette lighters and cases, costume jewelry and handbags. Along with Volupte, this company dominated the carryall market in the 1940s and 1950s. Mayfair was a trademark of the Evans company. Finberg Mfg. Co.: Attleboro, MA. Makers of good quality guilloche enamel compacts in the 1930s. Signed FMCo. Fisher: The J. M. Fisher Company, one of the oldest established jewelry firms in Attleboro, MA, was formed by John Melatiah Fisher and Charles R Harris in 1879. In the 1920-30s it was noted for its stylish and colorful compacts with unusual shapes and original, often abstract designs. The compacts are rarely marked but can be identified by their shapes, their one-link chains and the fragility of their brightly colored enamels. Ironically, the poor quality of the enamel means that few survive in top condition. They are very collectible. Paul Flato: He was a famous jewelry designer who catered to the stars of Hollywood from his shop on Sunset Boulevard in Los Angeles. In the 1920s and 30s he also had shops in Beverly Hills and New York. He designed high quality compacts, usually in sturdy cases with matching lipsticks. Many of Flato’s designs had whimsical detail and they are all known for their high quality. Theodore W. Foster & Brothers Co.: Providence, RI. They made great sterling and guilloche tango compacts in the 1920s. Signed F&BCo. Girey: An American company known especially for its “kamra-pac” compacts made to resemble small cameras. They often included powder, rouge and lipsticks. Gwenda: An English company noted for foil back scenes resembling butterfly wing. Henriette: A New York company noted for novelty compacts such as military hats and ball-shaped compacts. Annette Honeywell: A noted artist and designer in the mid-20th century. She created a series of designs with images such as a bullfighter, oriental dancer and a child on a merry-go-round among others. 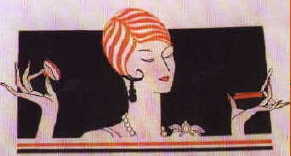 Her designs were used for a series of zippered compacts with the Lady Vanity trademark. Houbigant: A perfume and cosmetics company founded by Jean Francois Houbigant in Paris in the late 1800s. Compacts featuring Houbigant’s flower basket logo and vanities with abstract deco designs are very collectible. Houpette: A French trademark noted for the telescoping Pli compacts. Richard Hudnut: A cosmetic firm of New York, they were known for the DuBarry, Deauville and Debut deco compacts. He began his cosmetic career in 1903. His company became one of the foremost cosmetic companies in the US. Italian compacts were ornately engraved silver compacts that often came with matching lipsticks and combs. They usually had hand painted enamel scenes of couples in countryside settings. These scenes were often taken from 18th and 19th century paintings. Marked 800 for the silver content or “Made in Italy," they became very popular after WWII when the compacts were exported to France and the United States. Department stores like Macy’s, Gimbel’s, Saks and Neiman Marcus sold them. They are very collectible today. Visit Noelle Soren's website at: http://davidandnoelle.net for a great history of these compacts. Kigu: An English company that made compacts until the 1950s. Marathon: Makers of nice quality deco compacts in the 1930s from Attleboro, MA. Mondaine: A trademark found on novelty vanities that resemble small books. Some also have cigarette compartments and are called Cig-Vanettes. Mondaine was also known for flat rectangular vanities with rope handles and round compacts with small lipstick compartments in their lids. Parker Pen-Wadsworth: They were the maker of novelty compacts like the Ball and Chain and the Hot Air Balloon. Plate: House of Plate, Detroit, MI. Makers of the Trioette vanity in the 1940s. Princess Pat: Princess Pat Ltd., Chicago, IL. Makers of the Vaniteen and small rouge and powder compacts. Pygmalion: An English company noted for their novelty compacts, such as the Sonata piano compact and the globe. Rex Fifth Avenue: A New York company and maker of compacts in the 1950s. This company later joined with Dorset, to become Dorset-Rex in 1951. Zell, Rex, Dorset and Columbia all had “Fifth Avenue” added to their names and so they are often called “the Fifth Avenues”. They all made moderately priced compacts. Ripley & Gowan Co.: Attleboro, MA. Established in 1874. They marketed compacts and jewelry in the names of R&G, R&G Co., LaMode, and the R&G letters within a padlock. Their earliest compacts date from the late 1920s. They made top quality guilloche enamel compacts. Schuco: A German toy company that manufactured teddy bears and other plush toys between the World Wars. They made several collectible compacts and perfumes in the forms of plush bears and monkeys. Very collectible. Stratton: A company founded in 1860 in Birmingham, England and one of the manufacturers of fine British compacts. They are still making compacts today. Hilda Terry: She was a well-known cartoonist and artist who created the character “Teena”, the quintessential teenage girl of the 1940s-1960s. Her cartoon strip was syndicated in newspapers from 1941 through 1966 in the US. Several of her cartoon scenes appeared in popular magazines and on Rex compacts during this period. The artist was also a teacher and taught at the New York School for Social Research in New York and the Phoenix School of Art and Design in Phoenix. Thomae Co.: The Thomae Co., Attleboro, MA, made top quality sterling guilloche enamel compacts in the 1920. Vashe: A maker of small fashionable compacts in the 1930s and 40s. Volupte: A New York company that along with Evans, dominated the carryall market in the 1940s and 1950s. They also made some very collectible figural compacts such as the hand compact series. Wadsworth: The Wadsworth Watch case Co., Dayton, KY was established in 1890 as a maker of gold filled watch cases. In the 1940s and 1950s they also manufactured nice quality compacts. They were eventually purchased by Parker Pen Co. and became Parker Pen Wadsworth. Zell: Zell Fifth Avenue, one of the Fifth Avenue compact companies along with Rex, Columbia and Dorset.